Ever heard of or tried Osmanthus to make any dessert? Osmanthus is a native plant in warm temperate zone, like Asia. The flower is very small, about 1 cm long with strong fragrance. Chinese people like to make tea and desserts with the tiny dried flowers. When summers come, all kinds of chilled desserts with Osmanthus would come into place. As for this dessert, Osmanthus Jelly (桂花糕/桂花果凍) is quite popular in Hong Kong, not only because of its fragrance many people like, but also its simple cooking procedures. It is a jelly made from an infusion of dried sweet Osmanthus flowers. The sweet smell of Osmanthus brings up a refreshing feeling in hot weather. It’s quite a unique and charming dessert. Dried Osmanthus flowers often come in a little bottle, usually available at Asian stores or Chinese herbal shops. 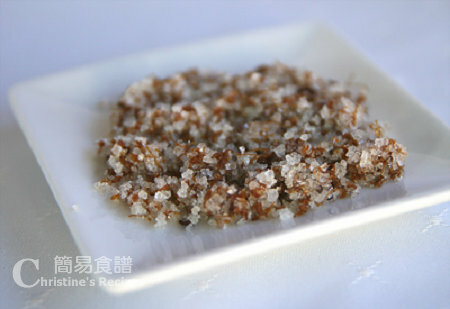 This time I used the sugared osmanthus flowers, came in a small packet that can make a double size of the recipe below. In the picture, you’ll notice that I also added a bit of grass jelly, black in colour for garnish. 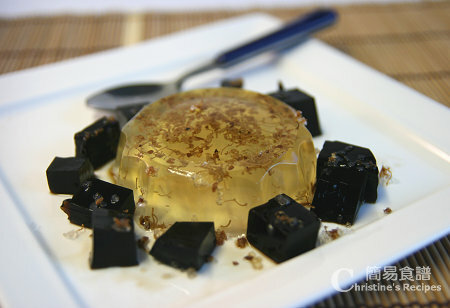 I just felt the bitterness of grass jelly (涼粉/仙草) going so well with the sweet Osmanthus jelly. Bring 300 grams of water to boil. Slower heat and dissolve rock sugar completely. Stir in Osmanthus sugar. Remember to taste by yourself and adjust to your own taste. It should be a bit sweeter than your liking in hot syrup. After chilling, it would be less sweet than in hot, and come down to your liking. Sprinkle galantine powder over sugar mixture and stir to combine. Pour into jelly moulds and refrigerate until completely set. The Osmanthus is quite easily settled on the bottom. Use a toothpick to stir well and help the flower spread evenly before placing in your fridge. I can't seem to find grass jelly in Australia though!!! Is this cannoed ones or fresh from tubes one? Thanks! I think you can find it at Asian stores. We have canned grass jelly at Asian stores. Ask the staff there to locate it for you. Wow! This is beautiful and delicious! I haven't heard of Osmanthus before, very curious to find and try it! Haven't heard or seen. But the dessert looks really good. Would love to try. Have to go and hunt for the ingredients. Oh yep..osmanthus tastes lovely in deserts! The jelly would exactly what I like after a meal or a late afternoon snack after shopping! Hi Christine, I just came back from my vacation. Still a lot more to catch up. This Osmanthus flavour jelly is something I wanted to try out but can't easily find the ingredient. I think I should go the Chinese Medicine shop to ask for it. Btw, where did you get them? You know, when I first heard of this goodie; was from the HTV drama series! No kidding! haha.... There are still many more recipes under my list to do LOL! So greedy. Wanted to try out everything but only have a pair of hands & only a few stomachs to feed! Yeah, these little flowers are attractive and have sensational taste in foods. I just bought some from my nearby Asian store. At first, I couldn't locate them because they are too small. I had to ask for the help of the staff there. I've never heard of osmanthus before, but based on your description I'm wondering if it will grow in Houston. I'm going to investigate. Beautiful jelly! I will try and find this. looks good! All new to me - shall check Asian stores - looks just delectable. I love osmanthus jelly. I used to not miss a chance to order it in a restaurant when I was in HK. I didn't know it's that simple to make though. BTW, I also miss grass jelly! I think I may have tried this in one or two Chinese restaurants but I never knew what it was. Thanks for the clarification! so pretty! I've never heard of that sugar before. It is such a beautiful looking dish!!! I can't wait to try it! osmanthus? howcome I don't know about it! Where can I find this? Such a lovely and refreshing dish. Looks perfect, wish I could taste some too! Great job! I've seen osmanthus but have not tried it, but now I need to. I cannot wait to try and I love the recipe you included! What if we were to use the dry flowers instead of the sugar ones. Would we need to change any part of the ingredients as well as the cooking way? If you use the dry flowers, that's even better. Don't need to change the recipe, just add a bit more sugar to your preference. Can we use honey instead of osmanthus sugar and add dried osmanthus flowers? coz i'm too sure if I can find osmanthus sugar here. Or do shops that sell dried osmanthus flowers will definitely sell its sugar as well? Thanks. You can use dried Osmanthus flowers and sugar. It will do. What is the galantine powder? where can i find it? Sorry, it's gelatine powder. You can find it at any supermarkets. I read about this recipe and i have tried it once but it turn out cloudy may i know what went wrong is it because i use fine sugar instead of rock sugar.The recipes say 300ml of water how many jelly can i make using the recipe mention. Is 1 tablespoon of osmanthus sugar enough for a portion size of a baking pan? The recipe here calls for rock sugar, water, gelatine powder and Osmanthus sugar. Nothing would make your dessert cloudy. I guess it might be the Osmanthus you used. Your question: Is 1 tablespoon of osmanthus sugar enough for a portion size of a baking pan? Ans: What size is your baking pan? Are you asking about whether the smell or sweetness of osmanthus sugar is enough? The osmanthus you use can be adjusted according to your preference. I used 4 jelly moulds to make this dessert. I'm asking about the smell and taste of the osmanthus jelly. The osmanthus sugar I used is bought from Chinatown in Singapore could it be I pour too much of it? Do I need to allow the liquid to cool before putting in the fridge? I suppose it could be the problem of too much osmanthus that made your dessert cloudy. Yes, let it cool down a bit, then place in the fridge. Briefly dip the base of the moulds into hot water, then turn your jelly upside down onto a serving plate. The base of my jelly moulds are removable, so it's much easier. Hi Christine, Can i use the seed of Osmanthus to make to a Tea and pour it together with the rock sugar instead of using Osmanthus sugar? Can i put the Osmanthus seed into the jelly rather then use the flower? Do you know how to make grass jelly? hi shufen, there is a shop in kallang bahru that sells osmanthus flowers! its near fairprice ntuc, but i'm not too sure of the shop's name. hope it helps! I feel the taste is a bit bland on its own so i find your idea of serving with grass jelly is excellent. I also add a few wolfberrys to the jelly as per other recipes on the internet. Also i filter out the flowers as i don't like the texture in the final jelly although they do look good visually. U can buy the 桂花 from hock hua branch..
3rd floor of the foodcourt in bugis street behind.. I use premix konnyaku jelly powder to do this jelly since last few years..